These are a current trend in many kitchens with people using infused oils. They give a rich flavour to many other recipes and cooking. You may currently buy infused oils from your local market or small boutique food store but you can easily make these at home. 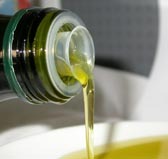 To make a good infused oil you need a selection of the best ingredients to bring out the best flavour. If these are being given as a gift for either Birthdays, Christmas, Mothers Day etc then why not use the best ingredients to show off. First you need to decide what flavour you want to have with your oil – many people use herbs or Chillies and Garlic. An example of the Herbs that can be chosen are Basil and Rosemary so we recommend you use fresh and organic produce to bring out the better flavour. Of course along with these you will need to choose a good virgin Olive Oil and of course it needs to be Australian. As this is oil we do not suggest you use Glass jars as this will cause a large amount of leaking. Use a Glass bottle with either a cork or a screw cap. For example our 250ml Dorica or 375ml Futura glass bottles. Using a glass oil bottle as well means you get the best flavour as well as presentation but you also need to take into account the colour of the bottle. For Australia due to UV rays we recommend using Antique Green colours. Always wash your ingredients prior to using them and then allow them to dry as bacteria can grow on water that can remain on your ingredients and then when the go into the oil it can cause some issue later. This can prevent Botulism which is rare and serious. This can also be helped to be prevented by Heating all the ingredients together. This depends on what you are putting in. Fruit and Chilli need to be sliced. Place these into a Glass jar with the Oil and leave for 1 – 2 weeks depending on how strong you want the infusion. When you are happy with the taste strain out the ingredients and rebottle into your choice of Glass Bottle and then close and seal.